8" Mini Push Nut Roller for Backyards - Black Walnut Cracker for Serious Nut Crackers! Easily picks your Pecans, Almonds, Hazelnuts, Large Acorns, Small Acorns, Joba Beans, English Walnuts, Macadamia Nuts, Sweet Gum Balls! 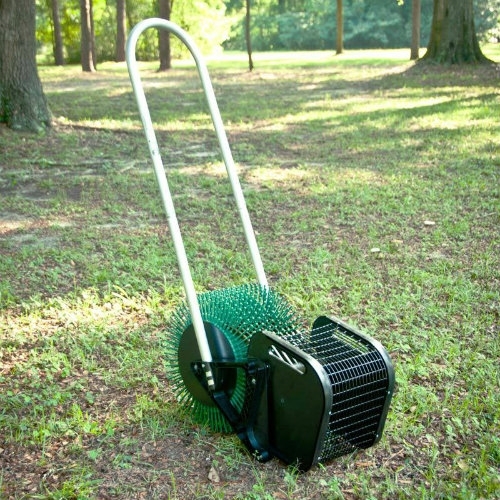 Ideal for backyard nut gathering, the Mini Nut Harvester is a nut roller that is easy to use at an affordable price. This mini nut gatherer is recommended for one to two trees and yields amazing nut results! Finally an effective nut picker upper for harvesting Pecans, Almonds, Hazelnuts, Large Acorns, Small Acorn, Joba Beans, English Walnuts, Macadamia Nuts and Sweet Gum Balls! Just push the Bag-A-Nut Mini Harvester over your specified ground and watch as the wheel's 'magic fingers' grabs your nuts and empties them into the harvesting basket. Simply lift the basket out, empty and return to pushing your nut roller. Uneven ground? No problem! The easy-to-push nut picker upper is versatile and effective. Gather your nuts in no time. Save time and effort with this nut roller! This simple assembly is lightweight and easy to use. You will not be disappointed with this nut harvester. Mini Model ideal for one to two trees! A nut picker upper that works! The Mini nut roller is designed for one to two trees. Have more? No problem. We carry a full line of nut rollers, nut picker uppers and nut harvesters. We have the solution for you!